your own Income Activator Website. Companies can pay $10, $20, $50 + for a lead. 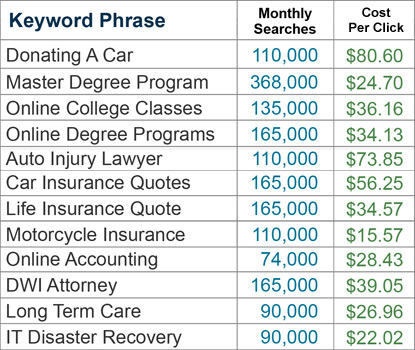 The chart below shows you some of the keywords people search for on a monthly basis, and how much advertisers are paying per lead. It's free to sign up. All you do is register with Google AdSense. For example, they keyword phrase Donating A Car is searched on Google 110,000 times per month, and the advertiser pays Google $80 per click. If this ad was on your website, and one of your visitor's clicked on it, you'd receive 68% of that revenue. You can use Google's Keyword Planner to search for your own keywords to see how much advertisers are paying for those leads. To do this, simply sign up with to Google AdWords, and use their Keyword Planner. It's free to register. The video to the right gives you an overview on how the keyword planner works.